A government group representing lower Manhattan voted last night in favor of plans to build a controversial mosque two blocks from the World Trade Center site. After four hours of discussions between opponents and supporters of the proposed Muslim community center, called Cordoba House, the community board voted 29-to-1 in favor of the plans. The vote is not binding in any way, but is seen as a gauge of public opinion. Mayor Michael Bloomberg, State Senator Daniel Squadron and City Council Speaker Christine Quinn support the plans for the 13-story building, which would include a swimming pool, auditorium , exhibition space and as an area for worship. Still, many others nationwide have voiced their opposition to the plans, saying the mosque will be an ugly reminder of the extremist ideology behind the terror attacks. Julie Menin, the community board chairwoman, told The New York Times she had received hundreds of calls and emails about the plans, most of which were from outside New York. Plans to build Cordoba House, a 15-story Islamic Center two blocks north of Ground Zero, received a major boost yesterday when a Manhattan community board backed the proposal by a 29-to-1 vote. Imam Feisal Abdul Rauf said the center would help “bridge and heal a divide” among Muslims and other religious groups. I can’t. 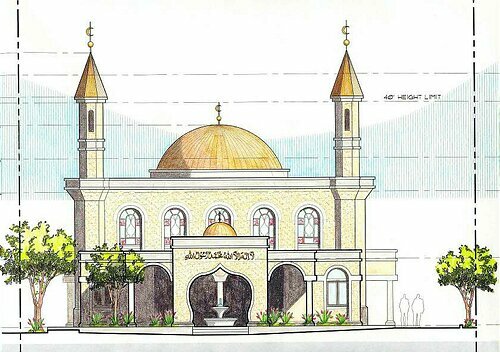 But the name of the Center should help increase our understanding of Islam. Let’s make one thing perfectly clear up front: I’m no fan of Islam. Then again, I’m no fan of the Catholic church or fundamentalist Christianity either. I confess that Mormonism befuddles me, and I’m weirded out by Wicca. Conservatives love to cite the Constitution when arguing a point, but in the case of the proposed Cordoba House community center in lower Manhattan, they’ve conveniently forgotten about both of these amendments. The project sponsors voluntarily presented their plans to the Community Board of lower Manhattan on Wednesday, May 5; they did not have to do so. As board member Ro Sheffe noted, “They own the land, and their plans don’t have any zoning changes.” The board members present at the meeting voted unanimously to support the project. There are some things you just don’t do, no matter how well-intentioned. You may recall in 1993, Pope John Paul II ordered Carmelite nuns to remove themselves from a convent they established on the grounds of Auschwitz, after years of Jewish protest. Even though the Nazis did not massacre Jews there in the name of Christianity, Jews saw the presence of the convent on the most notorious site of the Holocaust as an affront. It was plainly not meant to be, but it was, and one can certainly understand why, given what happened on that site, and the history of anti-Semitism in European Christianity. If reconciliation and peace is what one wants to see between Jews and Christians in the Holocaust’s wake, erecting a site of Christian religious worship on the site where millions of European Jews were gassed and burned is not the way to do it. Then there’s Andy McCarthy, National Review writer and recent author of a book arguing that liberals are consciously conspiring to betray America to the ravenous Muslim horde. McCarthy recently pointed out on Fox News that there are 2,300 mosques in America, but no churches or synagogues in Muslim holy cities Mecca and Medina. First of all, I think this fairly puts to rest any notion that the more militant strain of anti-Islamist hawkishness is anything other than full-scale, civilizational hatred. After this eruption, it’s going to be a stretch to take seriously claims that the interest of the right-wing base in armed conflict in the Middle East is about anything but an active desire for full-on race war. (I’ve taken some heat in the past for using this term, but I stand by it. The occurrence of the phrase “monkey god,” I think, makes my point rather neatly.) Moreover, it’s penetrated quite far into the mainstream of the right, with the flowering of a sub-literature that treats migration patterns and labor markets in Europe like they’re the secret plan for the conquest of Christendom. In recent years, liberals have become fond of pointing out that this kind of belligerent overreaction to the terrorist threat is exactly what makes terrorism effective. It plays into the hands of Osama bin Laden to treat Islam like our foe in a global, apocalyptic struggle. That’s exactly how he sees it, and joining him in this fantasy endorses al-Qaida’s ideology. This is a true and important point, pragmatically. But there’s something even worse going on here. It’s not just that Gellar, McCarthy, Williams and the rest in the War-with-Islam group are inadvertently playing into the hands of Islamic extremists. They are, exactly, their analogue within our own society. The same things that benefit Islamic radicals benefit anti-Islamic militants. Both groups feed off conflict, and prosper when violence erupts. Their only break from accusing Islam of guilt in wars and mass violence seems to come when they call for wars and mass violence against Muslims.